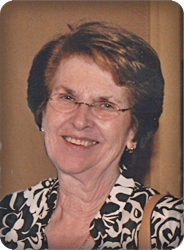 Donna Marie Symons, age 84, of Caledonia, passed away peacefully on Tuesday, March 12, 2019, with her children by her side. Her biggest joys in life were her children, grandchildren, and great grandchildren. She also enjoyed spending the winters in her home in Florida. Donna will be lovingly remembered by her husband of 68 years, Albert J. Symons; her children, Greg (Brenda), Michele (Rob), Susie; four grandchildren, Taylor (Andrew), Garrett, Amy (Sergio), Alan; a great grandchild, Elijah; sister, Lynn (Jack); several nieces and nephews. She was preceded in death by her parents, Harold and Augusta Remington; brother, Ray; and sisters, Eleanor and Carole. The family will greet visitors on Saturday, March 16, at Gethsemane Lutheran Church, 3152 Clyde Park Ave. SW, from 3 - 4 pm with the service following at 4 pm. Pastor Lee Welker will be officiating. Interment will be in Chapel Hill Memorial Gardens. In lieu of flowers, memorial contributions may be made to the March of Dimes or Gift of Life, MI.